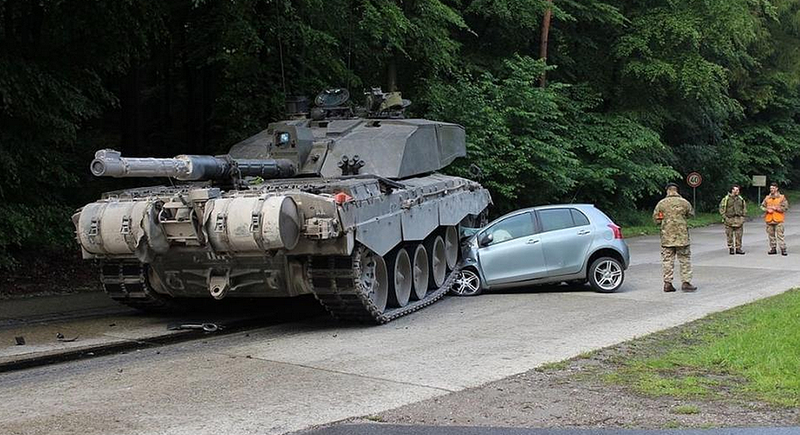 A student driver blindly pulled out in front of a column of British armor that was cruising along a hardened road in the Lippe district of Germany yesterday. A collision ensued and yes, you guessed it, the one ton Toyota Yaris lost the fight to the 60+ ton Challenger II Main Battle Tank in a big way. The tank’s 24 year old driver was able to slow down enough before impacting the little Toyota so that thankfully nobody was injured. The tank’s crew quickly assisted the stunned driver in training out of the smashed Yaris right after impact. The BBC reports that the Yaris received $13,200 worth of damage (totaled?) and the tank was unsurprisingly unscathed. Looking at the pictures, the tank was probably just a couple miles per hour and/or couple feet from riding right over the Yaris’s driver’s seat. Such an act is not something that crash safety standards require a subcompact, or any car for that matter, to withstand. The driver was lucky to say the least. On the bright side, this could possibly be the best student driver teaching moment of all time. Always look before turning kids or you could get run over... literally... By a tank.